Three Minutes to Save a Life, which aims to support students who may experience suicidal thoughts, is featured in the #MadeAtUni campaign which highlights the ways universities have improved everyday life. More than 800 University staff and students – including security, caretaking and academics – have been trained to recognise early warning signs in at-risk students and how they can escalate concerns proportionately and compassionately. The programme is a collaboration with Connecting With People and is led by Clare Dickens, a nurse and Senior Lecturer in Mental Health at the University, who is a recognised expert in the field of mental health and suicide prevention. She said: “I’m delighted that Three Minutes to Save a Life is featured in the national #MadeAtUni campaign. We are incredibly proud of the programme at the University, which aims to equip staff with an awareness and ability to respond with compassion to those students who require help. “Three Minutes advocates that everyone should have a Safety Plan, much like we have breakdown cover for our car - we don’t hope it breaks but we do have a plan for if it does. As part of the training, participants create their own Safety Plans, which explore a person’s individual needs and strengths, contacts for support as well as professional help. #MadeAtUni is a new campaign to bring to life the impact of universities up and down the country on people, lives and communities. 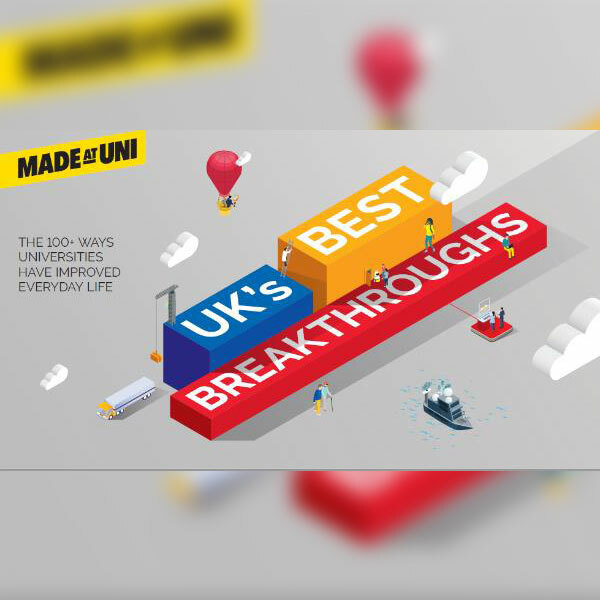 As part of the MadeAtUni campaign, universities around the country were invited to nominate the one thing from their institution which they believe has had the biggest impact on people, lives or communities. Over 100 universities submitted a nomination and the entries cover health, technology, environment, family, community and culture & sport.